The Patient and Family Advisory Council for Quality (PFACQ) at MSK is made up of current and former patients, family members, caregivers, and clinical and administrative staff. 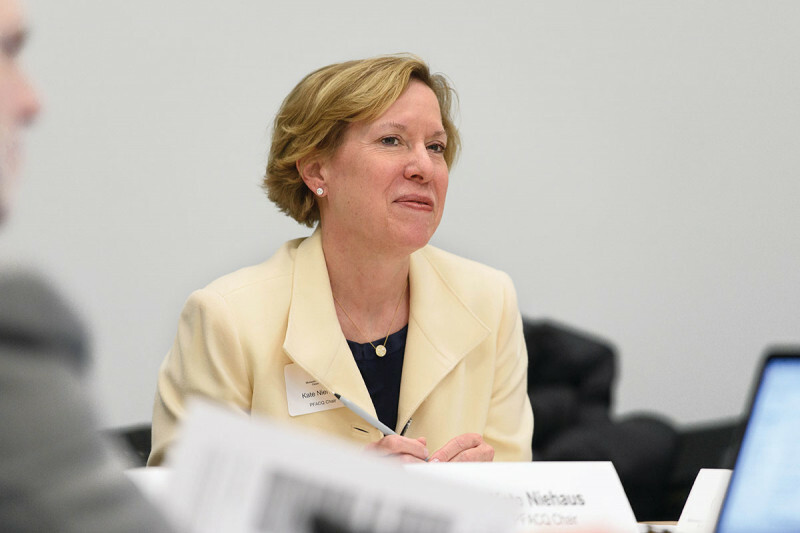 Shown here: Kate Niehaus, PFACQ Chair. Much of the work of MSK is done through committees made up of clinicians, scientists, and administrators. Since the formation of PFACQ, our members have played a meaningful role on these committees to represent the patient and family perspective. This group serves as a sounding board for the Integrative Medicine Service and aims to educate patients and families about the offerings of MSK. In addition, members of this group are part of a Patient-Centered Outcomes Research contract study team. We worked closely with the MyMSK team to enhance the online experience for new patients and their family members as they prepare for their first visit. We joined the MSK Strategy & Innovation group in design workshops to envision the optimal caregiver experience. We also are working collaboratively with the group to find ways to better manage chemotherapy side effects in order to limit inpatient admissions. We participated in evaluating grant applications submitted by young investigators to MSK’s Division of Quality and Safety. We developed a short introductory video for new MSK patients to provide tips, information, and reassurance. We are currently creating a video resource for family members on how to best prepare to take on the role of a caregiver. These multidisciplinary meetings are designed to dissect unfortunate events or “near misses” and determine a course of action to avoid similar errors in the future. We reviewed materials that would be used in a trial led by Judith Nelson that was aimed at addressing goals of supportive care. Identified a time of uncertainty that patients experience during their cancer journey when they transition from active treatment to monitoring. We are working closely with the Division of Quality & Safety to collect patient experiences during this time, and to help identify practices to ease patients through this transition. Identified a resource for additional sources of funding for out-of-pocket expenses. Connected and shared information with Patient Financial Services; a resource is now being piloted in various departments. PFACQ members present at various conferences, such as ASCO Quality Symposium and Society for Participatory Medicine. We also assume leadership roles in establishing best practices for Patient and Family Advisory Councils and quality measures by participating as members on the Comprehensive Cancer Center Consortium for Quality Improvement PFAC workgroup and the Alliance of Dedicated Cancer Centers Quality Committee.